A day especially for you. As we are half way through 2019, this is the perfect time to reconnect with yourself. To take time out for a day, a day that is centred around releasing and renewing so that you leave feeling rejuvenated. Our day will begin and end with a Vinyasa Yoga, we will be energetically supported with a powerful heart centred meditation and our energy alignment releasing. We will be grounded with our vegan nutrition and refreshments and learn how to keep our bodies in peak shape as we raise our vibration. Please book in below to purchase your ticket. We have a special early bird offer of £129 until the 22nd May (Retail Price is £149 thereafter). 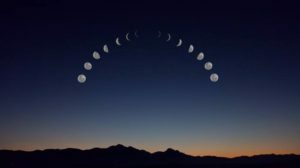 In ancient times women gathered at the new and full moons to connect with themselves, their monthly cycles, other women and the elements. Louisa will guide the women through a New moon ceremony to invoke your inner Goddess.